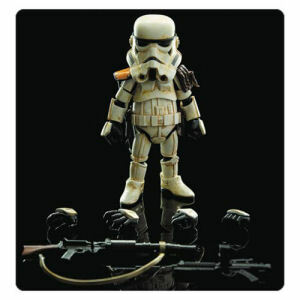 We have Just Sold out of Star Wars Sandtrooper Hybrid Metal Figuration Die-Cast Metal Action Figure. This Item is unavailable at present. From the Star Wars collection by Herocross. Star Wars Sandtrooper Hybrid Metal Figuration Die-Cast Metal Action Figure. Action figure measures 5 Inches tall. Sand Trooper has over 20 points of articulation. Comes complete with 6 interchangeable hands - a special backpack - E-11 blaster rifle.